Solar Lights for Dock & Deck are perfect for use on docks, decks, steps, walkways, landings, gardens, and swim platforms. The solar light is available in 4 colors with sloped sides for safety. Made of high impact polycarbonate so it stands tough in harsh weather. The Solar Dock & Deck Light is available in Surface Mount and measure 6″ x 1.375″ (requires 4.125 circle drill). 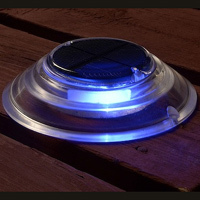 Solar Lights for Dock & Deck are available in 4 colors of lights – blue, green, red and white.